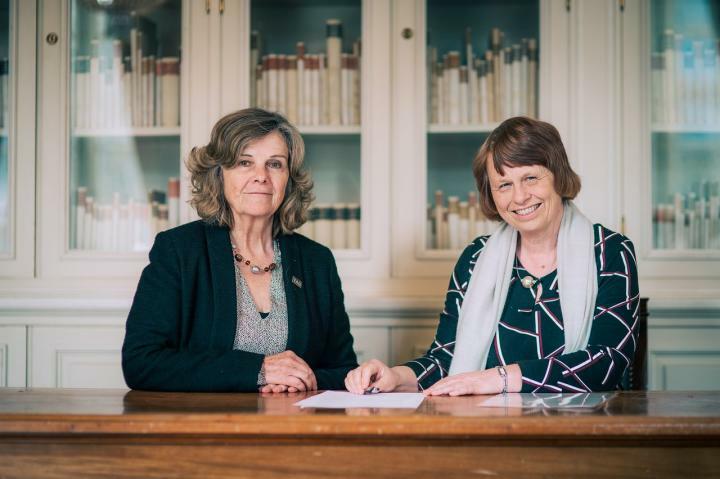 Representatives from the IAU and the Shaw Prize today signed an agreement to work together towards their shared goal of promoting astronomy, and utilising its potential as a valuable tool for education. The details of the agreement involve both recognising excellence in professional astronomy and the enhancement of astronomy in education. The Shaw Prize was established in 2002 to recognise active researchers who have recently achieved excellence in, or made outstanding contributions to, their scientific fields. The Prize is awarded in three categories of sciences, one of which is astronomy, the branch the IAU will be collaborating with. The agreement states that the IAU will issue a yearly press release announcing the winner of the Shaw Prize in astronomy to the media, its members and the public. In addition, the winner will be invited to give a plenary lecture at an IAU event within a year of receiving the prize, either at the IAU General Assembly, one of the regional IAU meetings, or one of the IAU Symposia, depending on which meeting the topic is most appropriate for. Furthermore, the Shaw Prize Foundation will provide funding for an annual Shaw-IAU workshop on “Astronomy for Education”, a key activity of the IAU’s new Office of Astronomy for Education which is part of the IAU Strategic Plan 2020-2030. “I am very pleased that we have this opportunity to collaborate with IAU, in giving recognition to the best achievements, and in promoting science as part of education”, said Kenneth Young, Chairman of the Shaw Prize Council. Teresa Lago, General Secretary of the IAU, said: “The signature of this Agreement between the Shaw Foundation and IAU and the financial support for the organisation of the annual Shaw-IAU Workshop ‘Astronomy for Education’ could not come at a better time. IAU is deeply engaged in setting up the new Office of Astronomy for Education and in arranging the 1st Workshop”. The agreement will come into effect with the announcement of the 2019 Shaw Prize winner and the organisation of the 1st Shaw-IAU Workshop in December 2019 in Paris. It will continue for an initial period of five years, with the possibility of renewal after that time. Established under the auspices of Mr Run Run Shaw in November 2002, the Shaw Prize honours individuals, regardless of race, nationality, gender and religious belief, who have achieved significant breakthroughs in academic and scientific research or applications and whose works have resulted in positive and profound impacts on mankind. The Shaw Prize consists of three annual prizes: Astronomy, Life Science and Medicine, and Mathematical Sciences, each bearing a monetary award of US$1.2 million.